Backflow preventers are mechanical plumbing devices installed in a plumbing system to prevent water from flowing backward in the system. A properly installed, tested and maintained backflow preventer can reliably prevent the backflow of water of an unknown quality from flowing back into the community water system. 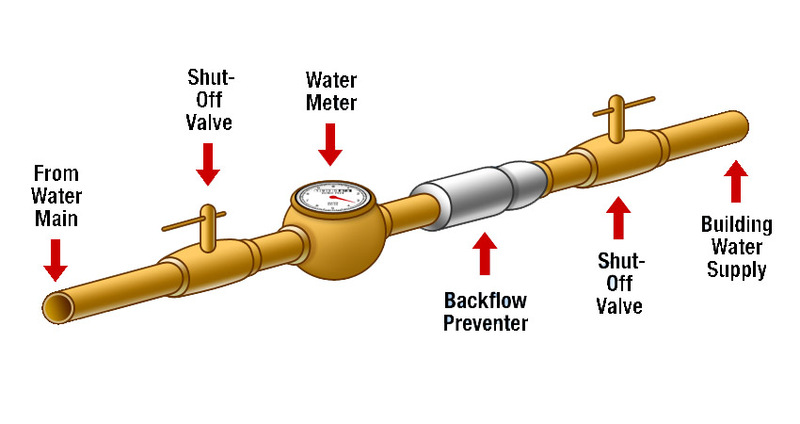 Is it really important to prevent backflow? Absolutely. The Ohio Environmental Protection Agency requires all public water systems to operate an on-going program to protect the public water supply from contamination from possible cross connections. The most effective method for water utilities to meet this requirement is to require customers to install a backflow preventer on the main supply line into their residential property or commercial facility, thus protecting the community water system from any cross connections that may be present inside a customer’s plumbing system. All water users benefit from an active, on-going cross connection control program that includes the installation of backflow preventers. A connection between drinking water pipes and any source of potential contamination is a cross connection. When the water pressure changes from internal usage or water system fluctuations, contaminated water may backflow into your plumbing from unprotected cross connections. Common household cross connections are garden hoses left in chemicals or in a pool and attachments to hoses used to apply lawn chemicals. Why does the customer have to pay for and install the backflow preventer? The backflow preventer is installed to protect the public water supply against possible hazards in the customer’s plumbing system. The actual or possible cross connection belongs to the property owner and not to the Municipality or other regulatory officials, such as the OEPA. Once the water goes beyond the meter, water quality could be altered. The Municipality does not want the water back, nor do water customers want to purchase used water. If a backflow preventer is required to keep the water safe, the person responsible for the cross connection (actual or potential) should purchase, install and maintain the backflow preventer. The most common example of an actual or potential cross connection is an auxiliary water system ~ a private well. To protect the public water system from backflow contamination and comply with OEPA regulations, the Municipality requires that customers, residential and commercial, install a backflow prevention device OR abandon their private well. Keep your well: There must be a physical separation of the well line from any public water line. An Ohio EPA approved backflow prevention device must be installed directly after the meter. After initial installation, the backflow prevention device must be tested to ensure that it is protecting against the back siphonage of water into the Municipality’s distribution system. The Ohio Plumbing Code requires an expansion tank be installed to prevent pressure build up in your home plumbing system. The Municipality has been informed that the cost to meet these requirements is between $400 to $800. Your individual plumbing layout and accessibility will affect the cost. Abandon your well: The well must be abandoned by a licensed well driller in accordance wth the Ohio Department of Natural Resources (ODNR fact sheet 92-6). The Municipality has been informed that the cost to abandon wells in this area is normally between $350 to $550. Your individual well location and depth will affect this cost. Why does a backflow device have to be tested on an annual basis? Who do I contact to test my backflow device? Contact a Certified backflow tester. You can find a Certified backflow tester in the phone book under plumbing contractors. Some lawn irrigation and fire protection companies employ certified backflow testers. To obtain the annual inspection form or forms may be obtained by Clicking Here or you may pick one up at the Village Administration Office or Water Plant. To view our documents you will need Adobe Acrobat PDF Reader (CLICK HERE) to view install instructions.